Photo: Basic but superb Rosy Guesthouse. The leafy riverside neighbourhoods around Siem Reap’s Royal Gardens are home to a number of luxury hotels where the likes of Angelina Jolie and Hillary Clinton stay when they’re in town. But cross over the river to the equally peaceful, and rather more traditionally Khmer East River Road and you will find Rosy Guesthouse, a small and friendly budget hotel where you can easily stay for an entire month—and you may well want to—and still pay less than the rack rate for a single night at one of Rosy’s big brand neighbours. 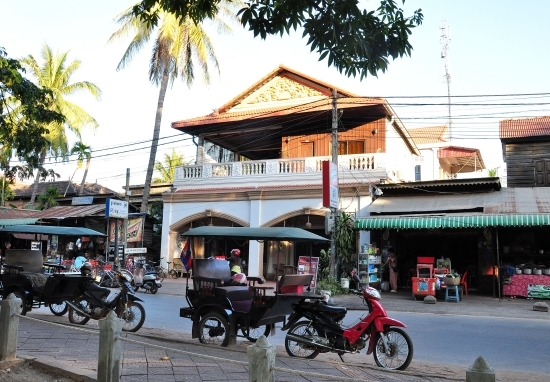 Facing a picturesque stretch of the Siem Reap River, Rosy’s is five-minute tuk tuk ride or an easy 20-minute walk from the town’s Old Market and lively Pub Street. The aforementioned Royal Gardens are opposite the guesthouse’s large terracotta-tiled bar and dining terrace and provide a great spot for a gentle early evening stroll, with formal gardens maintained by the Raffles Hotel, a small but busy Buddhist shrine and a colony of enormous fruit bats whose early evening forays provide a dramatic scene. A bit of a tardis really — 13 comfy rooms inside a traditional Khmer house. The Angkor National Museum is also within walking distance and the main entrance to the Angkor Archaeological Park, your gateway to the wonders of Angkor Wat etc, is just a short bike or tuk tuk ride away. 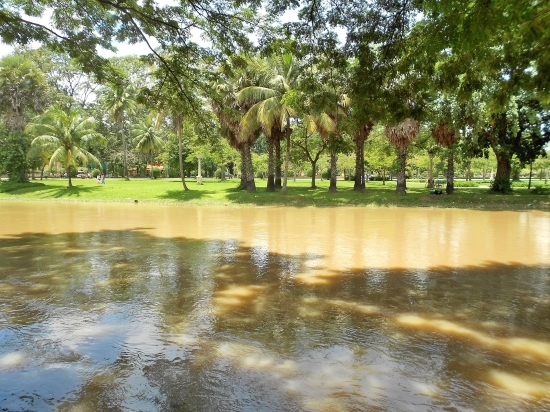 Rosy’s faces a picturesque stretch of the Siem Reap River. If you are prone to bursts of extreme inactivity, however, Rosy Guesthouse is just the kind of place where you may end up staying put on that terrace with a book or a board game and a cold glass of beer or freshly squeezed lime juice, gazing across the river. 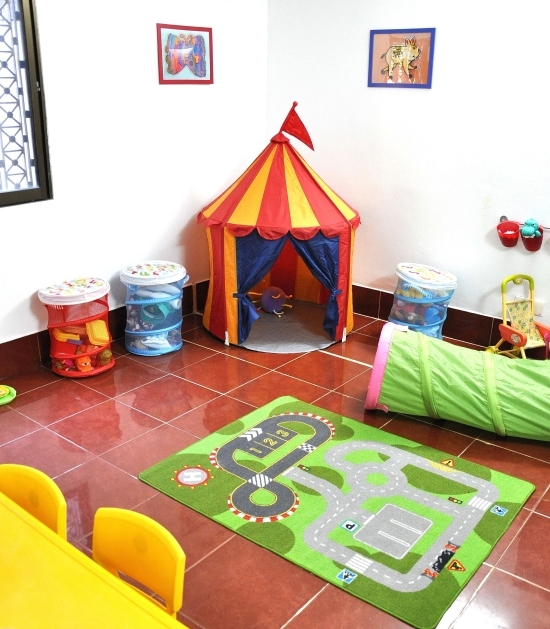 The English owners have installed a fully equipped children’s play room, complete with games, play mats, books and dressing up clothes so you can enjoy your lazy afternoons without feeling guilty about the toddlers getting bored. At $30 a night, the family rooms is also probably the best value family room we’ve found in Siem Reap. Good for children, great for parents. 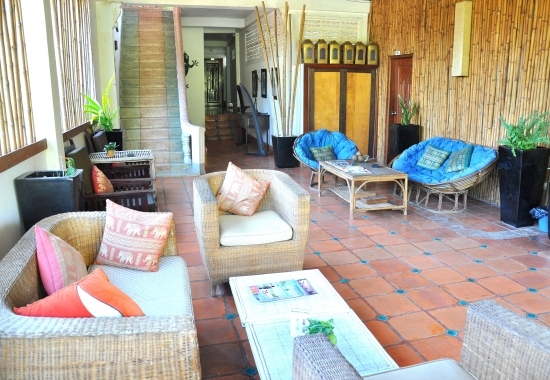 Above the bar and restaurant in this traditional Khmer house are 13 rooms ranging in price from $9 a night for a budget double room to $35 for a deluxe ensuite double with river-facing balcony. The four budget rooms are found off the airy bamboo-clad and palm-decked top floor landing, along with two shared bathrooms with hot water showers. The rooms are at the back of the building which means very little road noise although you may hear the sounds of monks chanting at nearby Wat Po Lanka. Each of the budget rooms has its own fan, cable TV, DVD player—choose from a selection of over 500 DVDs downstairs—a proper window and some hanging space. Although the budget rooms are compact—the double bed has one side up against the wall—and could do with sprucing up a bit, they represent great value if you are looking for a budget bolt-hole in a good location, and with a lively bar serving excellent food a couple of flights of stairs below. None of the rooms has a million dollar view, but the second floor deluxe double does have its own private balcony area facing the river, and the second floor superior double also opens directly onto a spacious furnished terrace area—a good place for a spot of early morning yoga. Each of the landings is furnished with tasteful silk lamps and Buddhist statues, and giant ornamental geckos. Nice spot for your sun salutation. The standard, deluxe and superior rooms have ensuite shower rooms, air-con, in-room fridge with daily included bottles of water, towels and soap, wardrobes instead of hanging rails, and bedside lamps. As you go up the price list you are progressively treated to more space and larger bathrooms. There is also a spacious family room that sleeps three, and a single ensuite room if you are travelling solo. Breakfast is not included in the room rate but the menu starts at just $2 for toast with butter and jam, fruit salad or eggs on toast and runs the full gamut up to the mammoth full cooked breakfast, which comes with bacon, eggs, home-made sausages, tomatoes, baked beans, chips and home-made brown sauce. Rosy’s restaurant and bar are justifiably popular throughout the day and night thanks to their generous home cooking, and to various social events, including big screen sports and charity trivia quizzes. Functions are usually over by 23:30 so noise shouldn’t be a problem if you are looking for an early start to catch the sunrise at Angkor Wat. 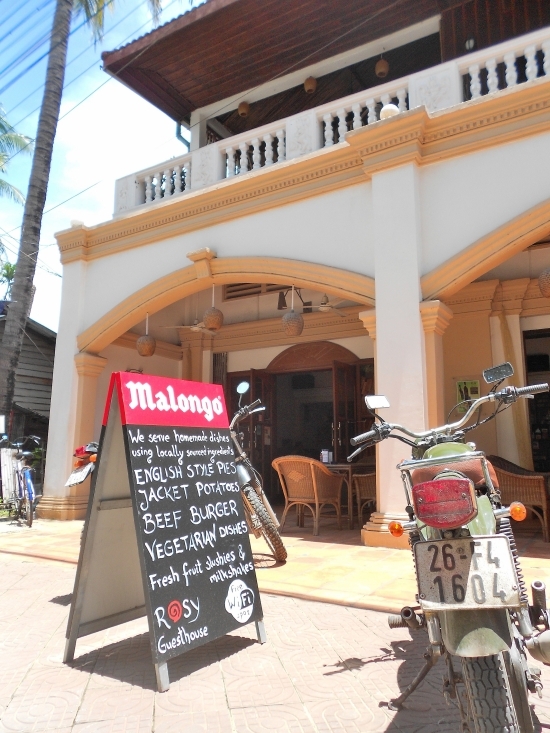 Rosy’s all-day menu is another good reason to make it your base in Siem Reap. Staff can organise excursions and will even make you a picnic to order should your day out mean missing a meal. There also have bicycles to hire for $2 a day, with all proceeds going to good causes. If that’s a bit too energetic, there is free WiFi throughout the property, and a couple of Skype-enabled laptops which are available on loan. 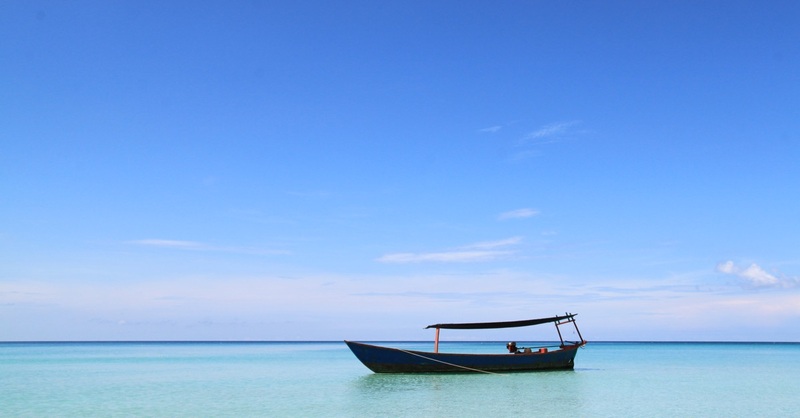 Pick ups from Siem Reap International Airport, any of Siem Reap’s bus stations, or the boat jetty at Tonle Sap for boats from Phnom Penh or Battambang are included in the room rate, and taxis can be arranged to pick you up at either Phnom Penh or Poipet on the Thai border. Having seemingly thought of just about everything, Rosy Guesthouse offers excellent value for the budget traveller and would also be a great choice if you are considering an extended stay in Siem Reap.